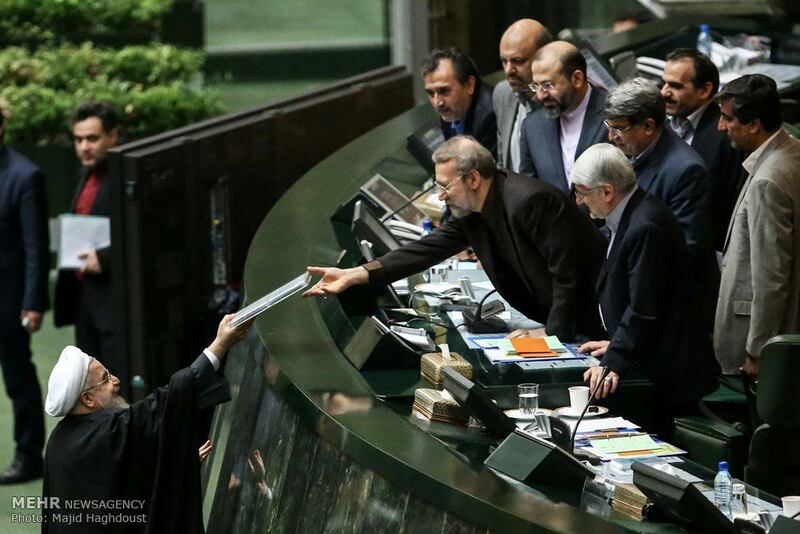 Iranian President Hassan Rouhani, left, presents a draft of the country's new budget and sixth development plan to the parliament speaker in an open session of parliament, in Tehran, Iran, Jan. 17, 2016. CAIRO- Now that international sanctions against Iran have been lifted, the Islamic Republic's relations with its neighbors, in particular Saudi Arabia, are being closely watched. Saudi Arabia, the dominant Sunni country in the region, is particularly on edge as Shi'ite-led Iran prepares to rejoin the world economy, said Gulf State Analytics founder Giorgio Cafiero. Sanctions relief is expected to release $100 billion worth of frozen assets back into the Islamic Republic's sagging economy. The financial windfall is considered one of the premier achievements of the current reformist government. Iran's central bank on Tuesday said it already sees $32 billion unfrozen, and industries like oil and air travel have resumed international business. Over the course of the nuclear negotiations that led to sanctions relief in exchange for a scaled-back nuclear program in Iran, the kingdom has been increasingly suspicious of U.S.-Iran relations, Cafiero said. Saudi Arabia views increased cooperation between the administration of U.S. President Barack Obama and Iran as a threat to U.S.-Saudi relations. "The Saudi leadership views the Obama administration's diplomatic overtures to Tehran as nothing short of betrayal," he said, "and as a major setback to Riyadh's geostrategic interests in the Middle East." Saudi Arabia's recent execution of a prominent Shi'ite cleric signals that the kingdom does not intend to take this setback lightly, according to Cafiero. The execution prompted an attack on the Saudi embassy in Iran and a subsequent severing of diplomatic ties between the two regional giants. "The Saudis' execution of Sheikh Nimr al-Nimr was intended to send a message not only to a domestic audience, but also to Washington," he said. "Put simply, Saudi Arabia will seek to counter Iran's expanded influence on its own terms." Iran and Saudi Arabia are often described as being perpetually at odds because both countries view their relationship as a zero sum game. This means they view any economic or geopolitical win from one side as an equal loss for the other. Iran, however, is suffering under a deep recession brought on not only by sanctions, but by corruption and poor management, according to economists, and it could be years before the average Iranian feels the benefit of sanctions relief. Iranian President Hassan Rouhani said Tuesday that sanctions relief marked the beginning of a "difficult road" for his country as it re-enters the global economy. "Today is just the start for an innocent human who was kept chained unjustly by the hands and feet for 12 years," he said. "Sanctions are gone, but there is a long way between sanctions and development." 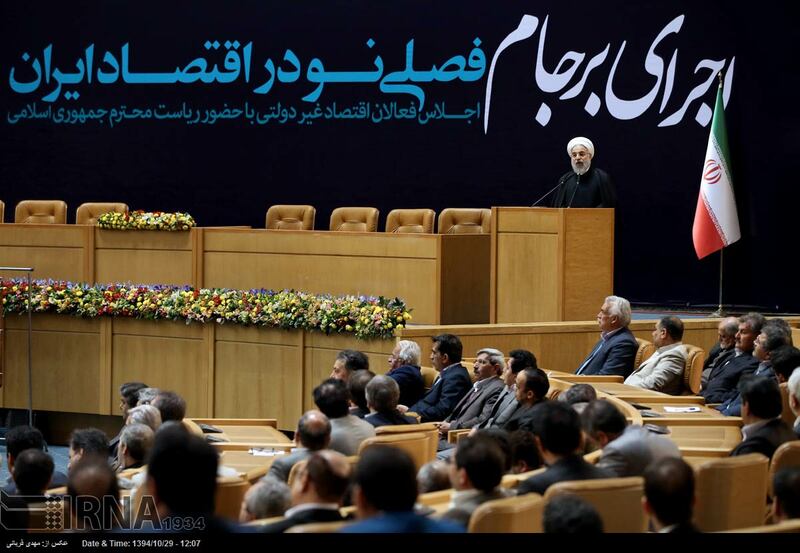 President Hassan Rouhani addresses a conference of entrepreneurs in Tehran on January 19, 2016. Rouhani's remarks come two days after the United States imposed new sanctions against the country's ballistic missile program. The new sanctions may partially be an attempt to allay fears among Gulf countries, said Theodore Karasik, Gulf State Analytics' Dubai-based senior adviser. But, he added, they may not be enough to quiet the increasingly tense region. "This move is a nod toward the [Gulf Cooperation Council] and their concern about the Islamic Republic's capabilities in this arena," he added. "However, the sanctions are only targeting a few firms and individuals." In the case of the Iran nuclear deal, one of the major "wins" for Iran is increased cooperation with Western nations, evidenced not just by the deal, but by diplomatic successes that followed, according to Reza Marashi, research director at the National Iranian American Council. The swift release of 10 U.S. sailors who the United States said had mistakenly entered Iranian waters and the release of several Americans from Iranian jails in a prisoner swap are both a result of the diplomatic channels opened through the nuclear agreement, he said. "I think it's a result of both sides deciding to use the diplomatic channel that the nuclear deal created to resolve other problems of mutual concern," Marashi said, adding, "Hopefully, this trend will continue." The trend, however, is fragile. Some hail the deal as one that will prevent Iran from developing a nuclear weapon in the near future and potentially rescue its economy, but it has also angered many other people. "Such progress achieved on diplomatic fronts is not irreversible," Cafiero said. "There are political factions in both Washington and Tehran that oppose diplomacy and prefer a confrontational relationship." And for those on the Iranian side who prefer confrontation, new sanctions can be held up as proof of Western treachery. Iranian leaders have already condemned the sanctions, saying they are illegitimate and will not impact the country's ballistic missile program. Additionally, the United States will have a new president next year, and Obama's overtures toward Iran have been highly controversial inside the country, according to Camelia Entekhabifard, an Iranian author and news commentator. After 35 years without formal diplomatic ties, she said, "it doesn't look like Iran and the next U.S. government have plans to normalize the relations."